How do I add students if I'm at an SSO/LTI school? The procedure for adding students to Education Perfect is slightly different if your school utilises Single Sign-On (SSO) and/or Learning Tools Interoperability (LTI) technology. 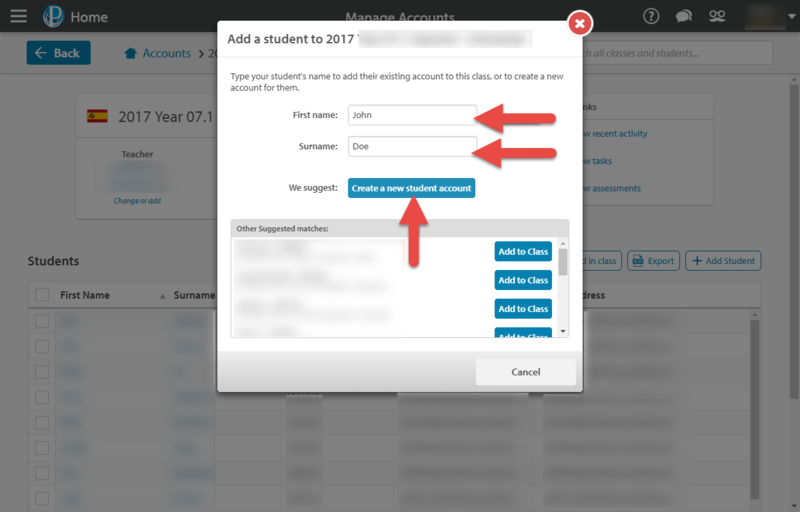 You will need to enter unique identification codes to link your new students' accounts to the school portal. 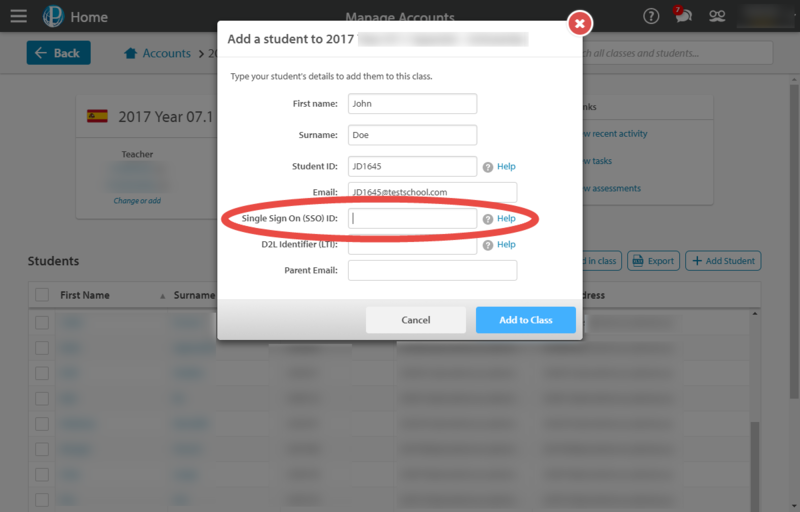 As with ordinary student addition, enter the Manage Accounts tab from your Control Panel, and navigate to the class you would like your new student to be added to. On the right hand side, select the Add Student tab. In the screen that appears, type in your new student's first and last name in the appropriate text boxes. Then, (if they do not appear in the list below) select Create a new student account. 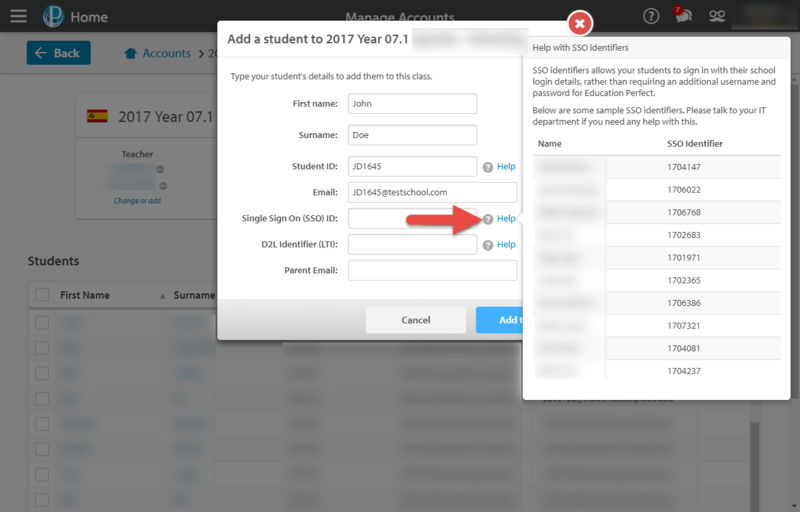 Add the student's details, but pay particular attention to the inputs for Single Sign On (SSO) ID. This is the code that will integrate the new student's Education Perfect account to your school's SSO portal. Follow the same procedure for D2L Identifier (LTI). If the SSO ID number is not input correctly, your new student will not be able to access Education Perfect through the school's portal. Similarly, if the LTI code is not correctly set up, they will not be able to use embedded Education Perfect content. You should be able to retrieve these codes from your school's IT department if need be. Often these will be related to other details, such as student ID or school email addresses. 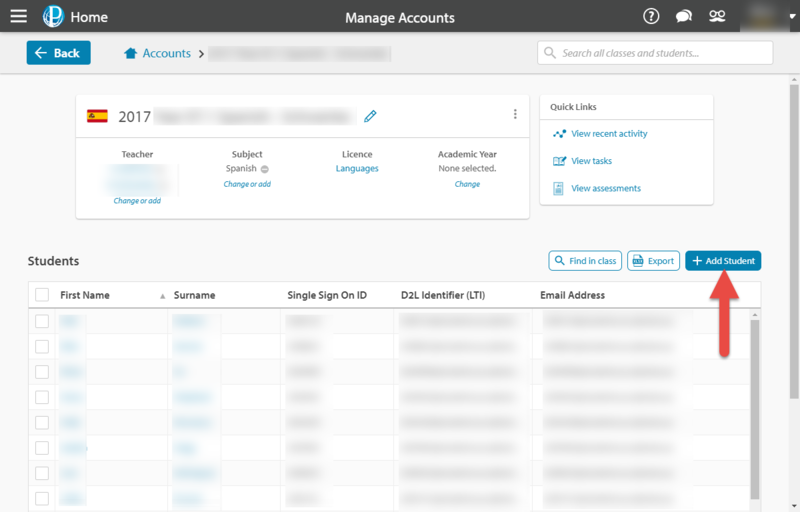 Hover your cursor over the Help icons, and you will be presented with examples of students and their associated SSO and/or LTI ID numbers, to give you an idea of what the SSO and/or LTI ID should look like. Once all the required information has been filled in, select Add to Class to finish setting up your student. Your student will now be able to log in through your school's SSO/LTI portal and be assigned tasks, homework, and assessments for this class.